1879 TENDER ESSAYS. Dummy stamps by McCorquodale in Claret. A very fine unused right-hand marginal block of Four. 1879 TENDER ESSAYS by Perkins Bacon in Brown. Six different mint examples in two strips of three. Some Tone Spots. 1881 16 Dot 1d Lilac, SG 172. A very fine four-margin IMPRIMATUR from Plate 12. Cat £250. 1912 1d Scarlet, SG 357. A lightly mounted mint block of four overprinted CANCELLED, Type 24, Spec N16w. 1879 Tender Essay by Perkins Bacon in Green. A four-margin mounted mint example. 1879 Tender Essays by Perkins Bacon in Black. A horizontal strip of six, mounted mint. Attractive. 1839 CHARLES WHITING 'POST OFFICE PERMIT' printed by "The Post Circular". A VERY FINE ESSAY IN GREEN. See under Essays GB Spec Page 5. 1922 1d Scarlet, SG 357, overprinted 'SPECIMEN", Type 23, Spec N16s, WITH 'ROUTE CABELGRAMS via IMPERIAL' UNDERPRINT in Red. Superb Unmounted Mint. 1881 5d Indigo, SG 169, overprinted 'SPECIMEN', Type 9, Spec K6s. A superb Unmounted Mint left-hand marginal Block of Twelve. Cat £1920. 1912 3d Violet, SG 375. OVERPRINTED 'SPECIMEN', Type 23, Spec N22t. Superb Unmounted Mint right-hand marginal. 1922 1d Scarlet, SG 357. Overprinted 'SPECIMEN', Type 23, Spec N16s, with "THE POST OFFICE SAVINGS BANK GIVES SECURITY" underprint in red. Unmounted Mint. 1859 May. 3d POSTAL STATIONERY POSTMASTER'S NOTICE FOR "EMBOSSED POSTAGE STAMP TO BE STRUCK UPON PAPER AND ENVELOPES" overprinted 'SPECIMEN'. SUPERB. 1902 1d PLATE PROOF. A very fine four-margin horizontal PAIR in DEEP GREEN ON THIN WHITE CARD showing DOUBLE IMPRESSION. 1902 1d PLATE PROOF. A very fine four-margin horizontal PAIR in the ISSUED COLOUR ON BUFF PAPER. 1902 10d PLATE PROOF, SG 254. A very fine four-margin BLOCK OF FOUR IN THE ISSUED COLOUR ON BUFF PAPER. 1911 1d PAPER TRIAL IN SCARLET ON JOHN ALLEN SPECIAL FINISH PAPER, Spec E. A superb mint four-margin BLOCK OF FOUR. 1911 DIE 1B, 1d PLATE PROOF IN CARMINE ON CHALK-SURFACE PAPER WITHOUT WATERMARK. A vry fine mint four-margin example. 1912 DIE 2, PAPER TRIAL IN SCARLET ON J. ALLEN MACHINE-FINISH PAPER, Spec 'e'. A very fine four-margin pair. 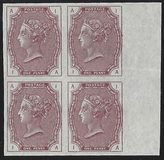 1902 10d Plate Proof, SG 254, in the Issued Colour on Buff paper. A very fine copy with four margins. 1902 1d Plate Proof in Deep Green on thin white card showing Double Impression. 1902 6d Plate Proof, SG 245. Very fine with four margins in BLACK on Thin White Card. 1902 5/- Plate Proof. Very fine four margins in the Issued Colour on Buff Paper. J Valentine of Dundee "PEACE" ENVELOPE PROOF of the unissued design in Red. A superb example. 1841 2d Postal Stationery Envelope overprinted Type P2 SPECIMEN IN RED. Prepared for the Post Office Circular. 1882 Postcard Essay on thin buff card showing an oval INLAND REVENUE/CERTIFICATE STAMP inscribed "Rough Sketch". 1877 TELEGRAPH 3/- SLATE BLUE, PLATE 1, COLOUR TRIAL lettered O-B. Superb unmounted mint overprinted SPECIMEN, Type 8, Spec T11s. 1870 6d Mauve, SG 109, Plate 9, lettered N-L. A superb, lightly mounted mint IMPERFORATE EXAMPLE overprinted SPECIMEN, Type 6, Spec J 177s. 1840 1d RAINBOW TRIAL IN DEEP BLUE ON WHITE PAPER DIPPED IN PRUSSIATE OF POTASH. A very fine four-margin example showing evidence of a Trial Cancel and use in Cleaning Tests. 1882 POSTCARD ESSAY IN BROWN with printed INLAND REVENUE/CERTIFYING STAMP and "ROUGH SKETCH". Scarce. 1837 DICKINSON'S 1d ENVELOPE ESSAY in YELLOW-BUFF. A fine example but small faults. 1902 1d PLATE PROOF IN DEEP GREEN ON THIN WHITE CARD. 1902 1d PLATE PROOFS. IN CARMINE ON THIN WHITE PAPER. MULTIPLE IMPRESSIONS. 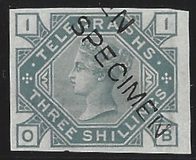 1900 ½d Blue-Green, SG 213. Very fine four-margin Block of Four Plate Proofs in the issued colour on buff paper.